The most recent Biosolids Management Study is posted here. RDN biosolids are applied to forest stands with nutrient-poor soils. The biosolids Forest Fertilization Project has demonstrated increases in tree growth of 80% over 18 years. Tree stands in the Biosolids Application Area grow on nutrient-poor rocky soils which are classed as "very dry" sites due to naturally low soil organic matter and summer drought conditions. Biosolids helps trees to achieve their maximum natural potential as though they were growing in ideal conditions. Trees fertilized with biosolids also appear healthier: needles and buds are longer, greener, and more numerous. 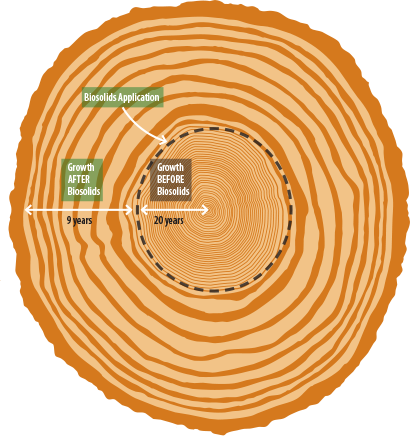 Comparison of tree growth rings before and after biosolids application. 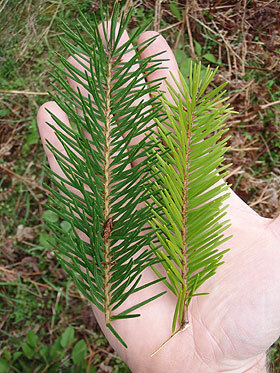 Comparison of Douglas-fir tree branches from a stand applied with biosolids (left) and unapplied (right). The 2012-2017 Surface Water Quality Report concludes that it is unlikely that biosolids application at the Land Application Site are having an adverse effect on surface water quality. No detectable impact on the five nearest residential water wells. Extensive research from the 1992 biosolids pilot project showed that trace elements introduced into the soil through biosolids applications generally do not move far below the soil surface - usually within 5-10 cm. Biosolids in this project are not applied over drinking water aquifers. The private forest lands used in the Forest Fertilization Program were formerly leased to Vancouver Island University, a past participating partner in the Biosolids Forest Fertilization Program. As such they conducted a number of research project on biosolids. 1992 - 1994 GVRD / VIU Operational Research Project - This joint research project focused on the movement of biosolids in ground and surface waters. Local residential wells were also monitored. 1992 - 2017 VIU Growth and Yield Research Project - 14 growth and yield plots were monitored regularly. Results show the long term effects that biosolids applications have on growth and yield of coniferous trees. 1998 - 2017 VIU /Ministry of Forests Biosolids Research and Demonstration Project - This research site was established in a recently-harvested area. The effect of biosolids applications on growth rates and wood quality of coniferous trees was tracked. Vegetation measurements, which are taken every three years, show that biosolids applications have greatly increased tree growth rates. How biosolids applications in both high and low nutrient sites affect the survival, growth and productivity of Douglas-fir and competing vegetation. How biosolids applications affect the forest's development and its nutritional status over time. How these changes affect the carbon balance of the plantations, i.e. the amount of carbon that will be stored in soil and vegetation over time.